stylos: The Vision (10/11/12): What does Lhasa have to do with Jerusalem? The Vision (10/11/12): What does Lhasa have to do with Jerusalem? What does Lhasa* have to do with Jerusalem? The Dalai Lama visited Charlottesville today. The name “Dalai Lama” literally means “ocean teacher,” the implication being that his teaching is deeper than the oceans. 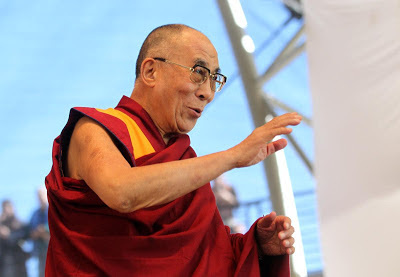 The Dalai Lama is both the spiritual leader of Tibetan Buddhism and the head of state for Tibetans in exile, who fled their land for Northern India in 1959 under duress from communist China which continues to occupy and govern Tibet. “Free Tibet” bumper stickers are still a ubiquitous and trendy staple in Charlottesville. The present Dalai Lama (now in his late 70s) is believed to be the 14th incarnation of the “Bodhisvattva of Compassion,” an enlightened being who is a sort of “patron saint” of Tibet. He was supposedly recognized as being the reincarnated lama while still a toddler in the home of a peasant family. Tibetan Buddhism departs from classical Zen Buddhism in that it is more animistic and shamanistic. In other words, Tibetan Buddhism places more focus on idols, guardian spirits, superstitions, totems, etc., holdovers, no doubt, from the pre-Buddhist traditional religions of Tibet. The Dalai Lama took part in two events on the Downtown Mall today, one at the Paramount Theater and the other at the Downtown Pavilion. I did not attend either of the events for which a purchased ticket was required, but I was in the area and talked with several people who had come to see the Dalai Lama. I was struck by how many Westerners have taken up an interest in Tibetan Buddhism. I have often said that in Charlottesville there may be more Buddhists than Baptists. No doubt, many are attracted to the exotic nature of this religion. Others are drawn to its non-dogmatic “all is one” philosophy, including its belief that all religions eventually lead to the same destination, its emphasis on meditation, spirituality, compassion, non-violence, and its tacit rejection of materialism. Seeing so many flock to this event is, in part, an indictment of the failure of the church faithfully to preach the gospel and to hold out the wealth of Western spirituality in the Christian faith to our fellow countrymen. One wonders how many would have meandered to Buddhism if they had known the oceans of the Christ consumed Puritans. 1. On the doctrine of God. Buddhism does not, in fact, believe in a personal God but speaks instead of an impersonal life force. It is, in fact, a God-less religion. Christianity believes in one true, everlasting, holy, and personal God who exists as Father, Son, and Holy Spirit. 2. On creation. Buddhism sees the physical world as a necessary evil. The goal of the spiritual life is detachment in overcoming the entanglements of physical existence. Christianity believes that God created the world good and made man to have dominion in stewardship over it. Though sin has warped even creation which groans for its renewal, the world is still basically good, declaring the glory of its Maker. It will one day be transformed into a new heavens and new earth. It is no accident that modern science, medicine, and technology developed in cultures influenced by the Biblical worldview. 3. On humanity. Buddhism holds that man is basically good and that he can choose to pursue things that lead to his good and the good of others through following a path of enlightenment (Buddhist teachings and spirituality). Christianity holds that man was the apex of creation, the only creature to be made in God’s image. The first human beings (Adam and Eve), however, sinned against God. In Adam’s sin all mankind fell. We are born with an inherited sin nature from our first parents, and we also personally transgress God’s commands. Though we retain the image of God, we are spiritually broken. We do not seek God or love him unless he first seeks and loves us. Jesus taught that the two greatest commands were to love God with every fiber of our being and to love our neighbor as ourselves. Believers experience a slow process of progressive sanctification in this life, sometimes beset with periods of decline (backsliding), as well as periods of rapid growth. Though saved, Christians remain sinners. Those who trust in Christ, however, will at the final resurrection be “glorified,” fully regaining their lost humanity, by God’s grace. 4. On salvation. Buddhism holds that one might attain detached enlightenment by following the “dharma” or teachings of the Buddha. It differentiates between monks, who are held to a higher spiritual standard, and lay believers. Biblical Christianity holds that salvation comes only by grace through faith in the Lord Jesus Christ who died on the cross for sinners and was raised so that those who believe in him might walk in newness of life and receive eternal life. The standards of the Christian life apply equally to all believers alike. 5. On the afterlife. Buddhism believes in the concept of reincarnation. At death one simply begins life again in a new creaturely existence. The goal is eventually to progress to a state of “Nirvana” or bliss. Christianity holds that each person only comes into existence at his conception. It is appointed unto men once to die and, after this, to face the judgment of God (Hebrews 9:7). The judgment of God depends on one key factor: one’s response to Jesus Christ. Those who believe in Christ enter the perpetual joy of heaven. Those who deny Christ enter the agony of eternal damnation. "One wonders how many would have meandered to Buddhism if they had known the oceans of the Christ consumed Puritans. " What a great commentary on the state of evangelism in our day.